I write this letter, because I care about the past, the present, and the future of the country in which I was born and grew up. Also, as an American citizen, I am deeply concerned about the steadily deteriorating domestic conditions in Hungary and the reckless foreign policy that you pursue against the fundamental interests of NATO, the European Union, and the entire Hungarian nation. During your student years, you criticized and actively opposed the dictatorship of the communist party. You were instrumental in the establishment of the Alliance of the Young Democrats. Your memorable speech at the reburial of Nagy Imre and the other martyrs of the October 1956 Revolution, in which you demanded the immediate withdrawal of the Soviet Red Army from Hungarian territory and subsequent free elections contributed to the collapse of the regime in 1990. Elected to the Parliament in the spring of 1990, you led your party in opposition in a constructive fashion. After the untimely death of Antall Jozsef, the first Prime Minister of the free Republic of Hungary, you made the politically expedient decision to transform the Alliance of Young Democrats into a “Civil Party”, thus releasing the genie of self defeating nationalism from the bottle of a non-existent Hungarian ethnic superiority. You prevailed in the national elections of 1998. Although your party only received 42% of the votes, you embarked on a policy of “winner takes all”, resulting in shameless corruption and revolting mismanagement of government. Accordingly, the voters rejected you and your party in 2002. During your eight years in opposition you organized street riots and other violent disturbances against the legitimately elected government. You declared total resistance and refused to attend the meetings of the Parliament. In this manner, you abdicated your responsibilities as the leader of a democratic opposition and turned yourself and your party into a highly destructive force in Hungarian politics. In 2010, you and your party were brought back to power with an absolute majority in the Parliament. As the head of an one party state, you have continued on the same destructive path that you so ineffectively walked in opposition. The list of your political, economic, social, cultural, and moral transgressions would take, if enumerated, several volumes. However, your most destructive political, economic, and moral offenses must be stated. You have had a real opportunity to create a model of European democracy to the world by respecting the independence of all three branches of government, especially the judiciary. Instead, you have invented the term “illiberal democracy” that have only demonstrated your lack of understanding of what democracy is all about. In your deranged arrogance, you have scattered the political reforms of the last quarter century and pushed the poisonous ideology of exclusive nationalism. Today, in order to cultivate an idiotic version of Hungarian exclusivity, you are in the process of raising a subservient generation that surely will not be able to stand its ground in the global competition. In economics, you again have misunderstood what capitalism is all about. You have established a corrupted form of “state capitalism”, best described as a Houdini economy, in which both the private business and the distribution of their products are controlled by you and your acolytes. By favoring individuals of your preference, while excluding others who refuse your game of “pay to play”, you have reinstated the same economic model that characterized Mussolini’s fascist state, Hitler’s national socialist empire, and Stalin’s gulag economy. Your heavy reliance on public works has brought forth an unqualified working underclass that wholly dependent on your government. This underclass that comprises one-third of the workforce, is neither free economically nor politically. Your and your cronies insatiable appetite for corruption have destroyed the health industry as well the hitherto excellent Hungarian education system. In foreign affairs you have turned yourself into the political prostitute of the European Union. While the European Union’s financial contributions have provided the life support needed to keep the economy above water, you have attacked the “imperial rule” of Brussels on a daily basis. 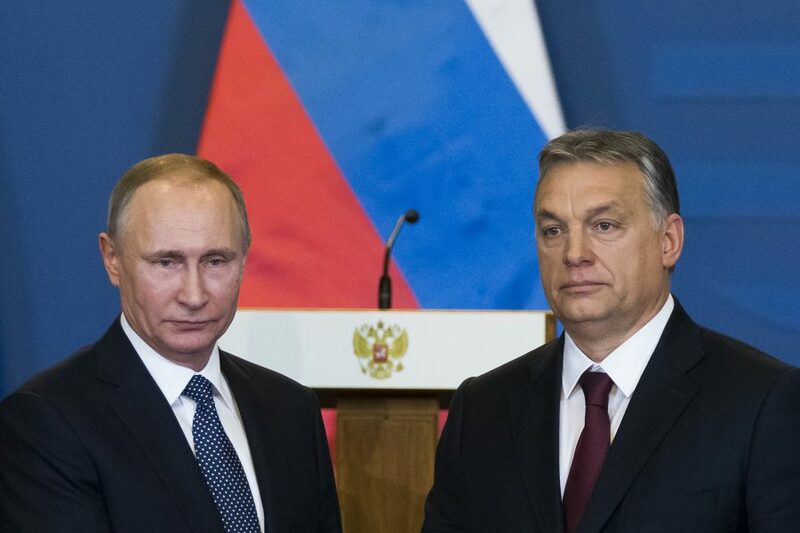 Using the Hungarian minorities in the neighboring countries as political pawns, you have tried to divide the member states of the European Union along racial and ethnic lines. Simultaneously, you have made highly publicized overtures to the Russian President Vladimir Putin, in order to justify your dictatorial regime at home. In the same vein, your alleged friendship with the President of Turkey Recep Tayyip Erdogan, have merely served to legitimize your indoctrination of the Hungarian youth. In closing, guided by your narcissism and megalomania, you have abandoned Hungary’s and Europe’s political, social, and moral ideals. Instead, you have been marketing your “illiberal democracy” and your corrupt economic ideas. These are not the values the Hungarian people have elected you for. These are not the ideals the Hungarian people aspire for. What they want is true democracy and economic freedom. These, in turn, are not the realities you care to acknowledge. Your sick ego calls for a despotic and morally empty state. You have failed your people. They must hope for your speedy departure from office to live free again, to think normally again, and yes to dream of a better future again. Dr. Miklos K. Radvanyi is the Vice President of International Policy at Frontiers of Freedom. He has earned advanced degrees from the Eotvos Lorand Scientific University, in Budapest, Hungary; the School of Advanced International Studies at Johns Hopkins University; and the National Law Center at George Washington University. He has also served as the foreign affairs advisor to U.S. Senator Orrin Hatch and U.S. Representative Christopher Cox. He escaped communist rule in Hungary during the height of the cold war and immigrated to America. He is an expert on geopolitical affairs, national security, and foreign affairs. He has written extensively and been published in at least three different languages and has lectured around the world on foreign policy and world affairs.